A reference to Kashmir evokes two kinds of imagery in our minds – guns, barricades, wailing women, trauma etc — in general, it’s all about unrest and chaos. The other, of course, comes from Hindi films of the 70s – post-card pretty landscapes. In the last few years as it simmered and tried to give peace a chance, there were few commentaries that gave us – the outsiders – a real glimpse of the land and the life. One was Basharat Peer’s Curfewed Nights and now a new body of work titled Kashmir by photographer Amit Mehra. An exhibition was opened recently in New Delhi’s Photoink gallery and a book will be released soon. It is difficult to work in a conflict zone; it is even more difficult to find a narrative which is not about the conflict, but about the people who live there. Conflict zones tend to get very dark and layered and it’s next to impossible to find an anchor, let alone the serenity of life there. Working in Kashmir poses another problem – the inherent beauty of the land. It’s easy to succumb to the temptation of making it picture post-card pretty. Amit has traversed this photographically- treacherous zone well and come up with a poignant visual commentary. Amit’s images reminded me of the great photographer André Kertész’s work. Many of them are quiet, snowscapes are stark. Some photographs show a hint of hope for peace though an underlying tension is palpable. The portraits of people such as aspiring footballers, business people in their homes etc are wonderful not only because of their photographic quality but also because they show a side of Kashmir that one has rarely seen. However, I felt that the exhibition could have done with a tighter edit. Amit’s work is a must-see for everyone. 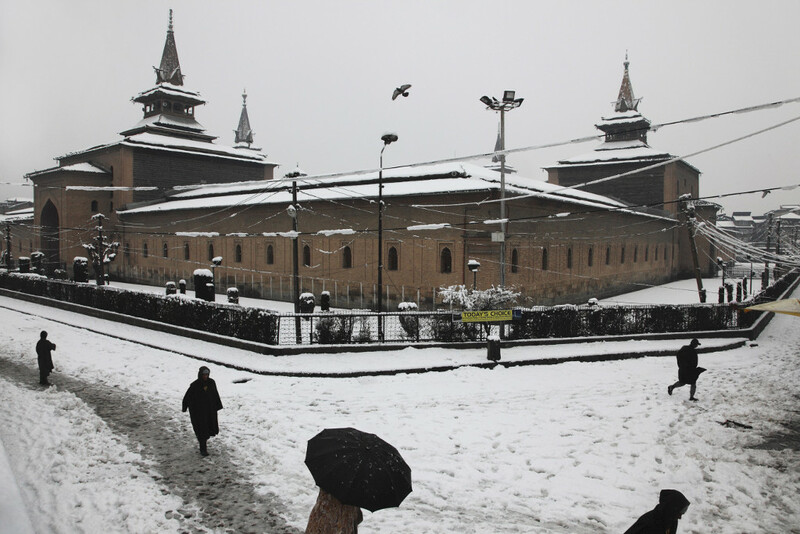 For people interested in Kashmir, it is a refreshingly new point of view. For the connoisseurs of photography, it’s a visual treat. Young photographers and students will get a peek into what goes into making a long term-photo project. It’s a great starting point for emerging photographers to understand the process of finding one’s voice. I hope that soon this body of work becomes available for a larger audience through his website or even a dedicated website for the project. Talking about his work, Amit says that it was hard to ignore the complex political narratives of the separatist movement and the insurgency that followed. This was both a dilemma and a trap, he adds. Was it possible to make a different kind of photograph, which was introspective and not illustrative? Could the anguish and pain of two decades, and perhaps more, be expressed without repeating what had been seen before? Was it possible to represent Kashmir without photographing the presence of the security forces and yet be able to suggest what it was like to live under constant surveillance? These were some of the questions which preoccupied Amit during his travels in Kashmir. I feel that he has been able to do all this in this body of work. Kashmir is one of the finest bodies of colour photography I have seen in the recent times. I eagerly await the arrival of the book. Amit’s previous book India a Timeless Celebration is a lyrical commentary on faith. His next project is Sufis: Messengers of Peace. He has also done a wonderful photo-essay on Javed Ahmed Tak of Anantnag for the second volume of my UNSUNG project. Javed, who became a paraplegic after being hit by terrorists’ bullets, now teaches computer skills to children with special needs. Note: Delhi-based Amit Mehra has been photographing for over 20 years. In addition to editorial and advertising work, he has specialised in architectural photography as well.